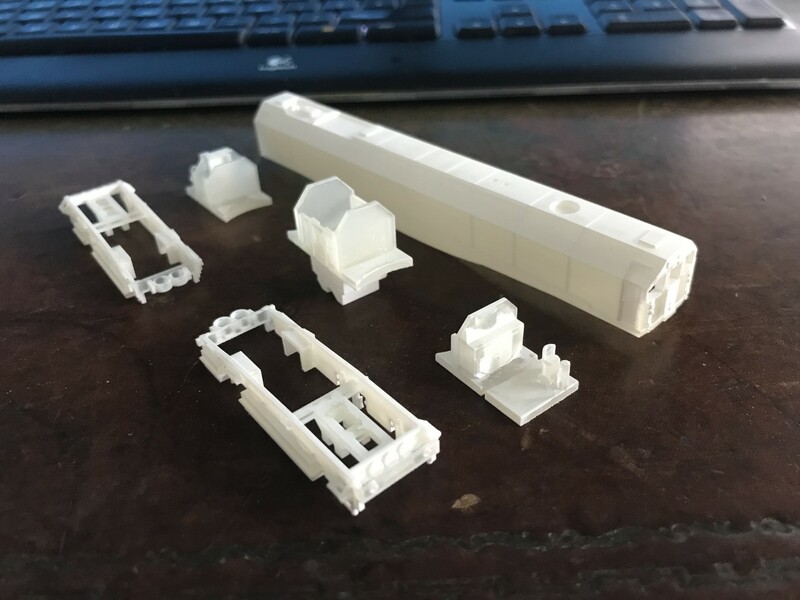 A last minute Christmas delivery from Shapeways is the newly released prints for an N SR Leader. This is probably one of the most unusual steam locos built and in my view its ugliness is second only to the class 66. The print has five parts which I will need to modify with my choice of mechanisation. The print is designed to work with the Tomytec shorty mechanisms and for this means of power is very well thought out. 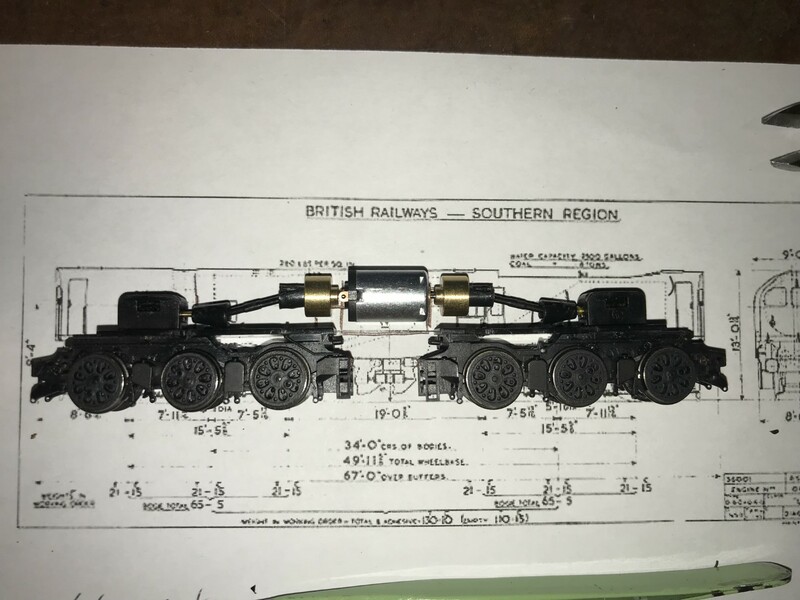 However as the Leader had 5ft wheels of the Bullied style (not 3ft discs) and as it makes a difference in running characteristics I will need to modify the bogies and their mountings. Here is the layout of the chassis I plan to use. I had to solve the drive before I ordered it and as you will see I have reversed the worm gear and drive on the Q1 chassis and started to cut away unnecessary parts. I will eventually build a pivoting structure above the motor once I have figured out how much space I have to do this. 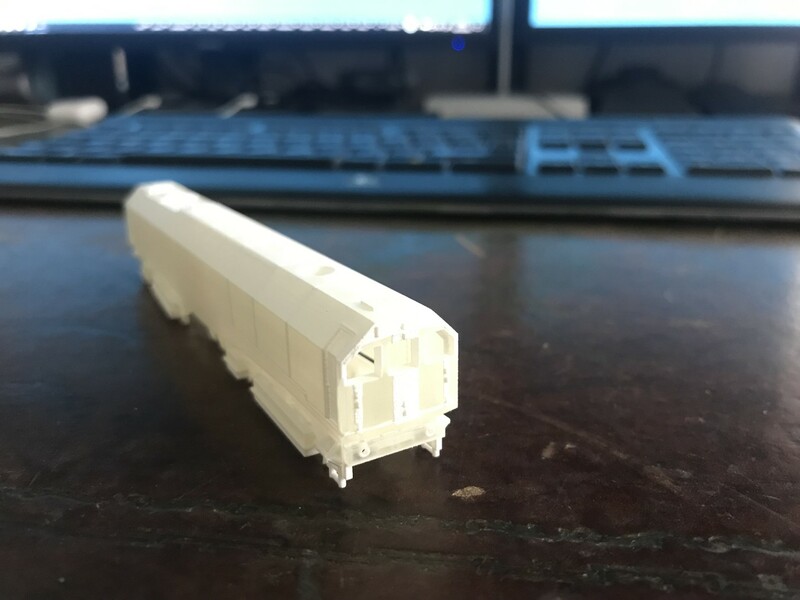 The print is very clean and accurate, and should make a very nice model. 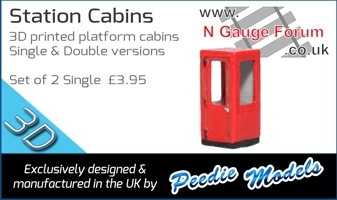 When you've nearly finished the Leader, don't forget to include the poor fireman leaning out of the side, gasping for breath - and the driver if you run it smokebox first. As I understand it, the Leader was innovative, ugly, fuel-hungry and far from popular with the crews. Next stage is a bit of thinking and a bit of experimenting on the bogie mountings. And to think perfectly decent looking Q1s were sacrificed to create this monster. Truly Frankensteinian indeed. 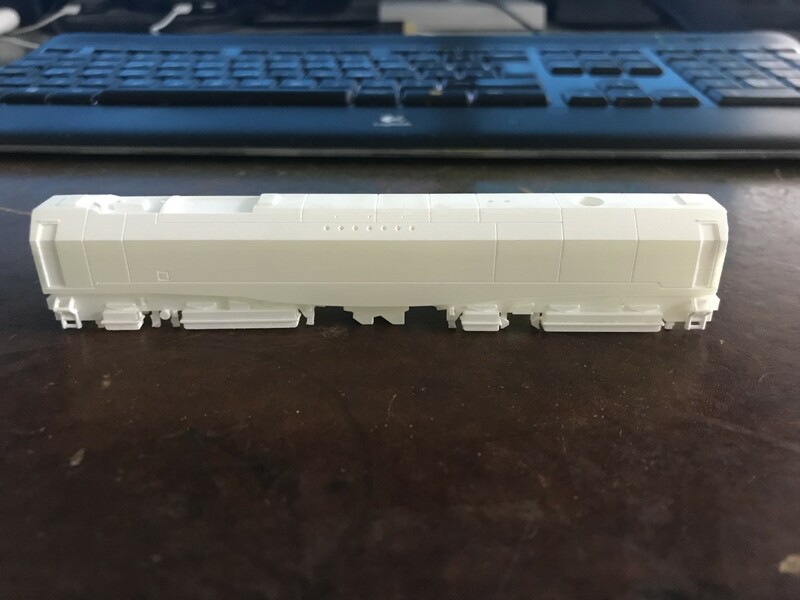 Did you get the body, bogies and interiors in smooth or smoothest detail plastic? The video seems to make it look like childs play using the designed chassis (which i know are underside in terms of wheel diameters but are nicely hidden behind the bogie gubbins. Body and bogies in the smoothest, interior and bunker in smooth. The bogie hangers are printed in their nylon, which I guess you could get in black. Rainy days in January morphed into February...never mind. Have been enjoying playing with this 3D kit. I have two questions for the illuminati of this forum. 1. The kit is powered by two Tometec 01 chassis (basically a Bo bogie) which while smooth runners, fly at very high speed and I suspect are 3v motors rather than 12v motors. I also want to wire them together to aid power pickup across the length of the loco, and avoid drop outs over frogs. Any suggestions regarding the resistor I should use to regulate these motors a little, and how to wire it up? 1. The kit is powered by two Tometec 01 chassis (basically a Bo bogie) which while smooth runners, fly at very high speed and I suspect are 3v motors rather than 12v motors. Try using inverse parallel diode strings rather than resistors. They're more efficient and don't heat up like a resistor does. Each diode drops the voltage by around 0.8V so trial-and-error to find how many to bring the speed down to what you want. I had to replace a Bemo railcar chassis with a Tomytech TM-23 recently, and of course the Tomy is smooth but rather fast at any given voltage. Not usually a problem but as the railcar runs on my automated shuttle system along with other units I needed to tame it a bit. I used SMD diodes equivalent to 1N4007, 4 in each direction arranged as 2 strings either side of the motor so they tucked nicely into a space where I'd lengthened the chassis. The diodes cost 99p for 100 so I have enough for other projects! Page created in 0.178 seconds with 39 queries.